The Tigerbelles Women’s Track club at Tennessee State University became the state’s most internationally accomplished athletic team in the mid-twentieth century. The sprinters won some twenty-three Olympic medals, more than any other sports team in Tennessee history. Mae Faggs and Barbara Jones became the first Olympic-winning Tigerbelles in 1952, and the Tigerbelles won another medal in 1956. Soon, Gold Medal winners included Edith McGuire, Madeline Manning, Barbara Jones, Martha Hudson, Lucinda Williams, Chandra Cheeseborough (two), Wilma Rudolph (three), and Wyomia Tyus (three). Tyus was the first athlete to win Gold Medals in the sprints in two consecutive Olympiads (1964 and 1968). 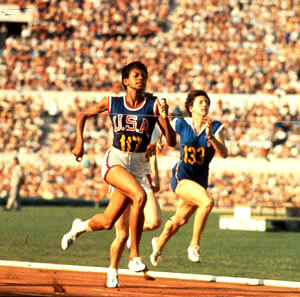 The first star of the Tigerbelles was Wilma Goldean Rudolph. In 1992, after ten years in Indianapolis, Wilma Rudolph returned to Tennessee to become a vice-president for Nashville’s Baptist Hospital. Two years later, shortly after her mother’s death, Rudolph was diagnosed with brain and throat cancer. Thereafter she seldom appeared in public, except for quiet walks around the Tigerbelles’ track with retired Coach Temple. Wilma Rudolph died on November 12, 1994, and thousands of mourners filled TSU’s Kean Hall on November 17 for the memorial service in her honor. Others attended the funeral at Clarksville’s First Baptist Church. Across Tennessee, the state flag flew at half-mast. In her short life, Rudolph became more than an athlete; she was the epitome of the triumphant human being. Her many honors and memorials testify to the respect afforded her by Tennessee’s citizens. In 1980 Tennessee State University named its indoor track for her. In 1994 she was inducted into the National Woman’s Hall of Fame and received two honorary degrees. A section of U.S. Highway 79 in Clarksville was renamed the Wilma Rudolph Boulevard (1994). Throughout the summer and fall of 1995, several events honored Rudolph’s memory: Clarksvillians held the Wilma Rudolph Breakfast in July; TSU dedicated a new six-story dormitory, the Wilma G. Rudolph Residence Center, in August; TSU’s Annual Edward S. Temple Seminars on Society and Sports named its annual luncheon the Wilma Rudolph Memorial Luncheon in October; and the Wilma Rudolph Memorial Commission placed a black marble marker at her grave in Clarksville’s Foster Memorial Garden Cemetery in November. In April 1996 a life-sized bronze statue of Rudolph was completed for mounting in Clarksville. In 2000 Sports Illustrated magazine ranked Rudolph as number one in its listing of the top fifty greatest sports figures in twentieth-century Tennessee.